Working moms who choose to continue their breastfeeding journey, while spending time away from home, work hard to maintain their commitment to their baby. It requires an investment of time, gear, and lots of patience. When it comes to pump options, there are several electric pumps that can work for on-the-go or for use in a private room while at the office. However, lugging around your purse, your pumping bag, and whatever items you may need is quite inconvenient. This post is sponsored by Caroline 220. I received a complimentary product to facilitate my review. All thoughts are my own. This post may contain affiliate links. Should you wish to make a purchase, I may receive a small commission at no additional cost to you which helps support this blog! 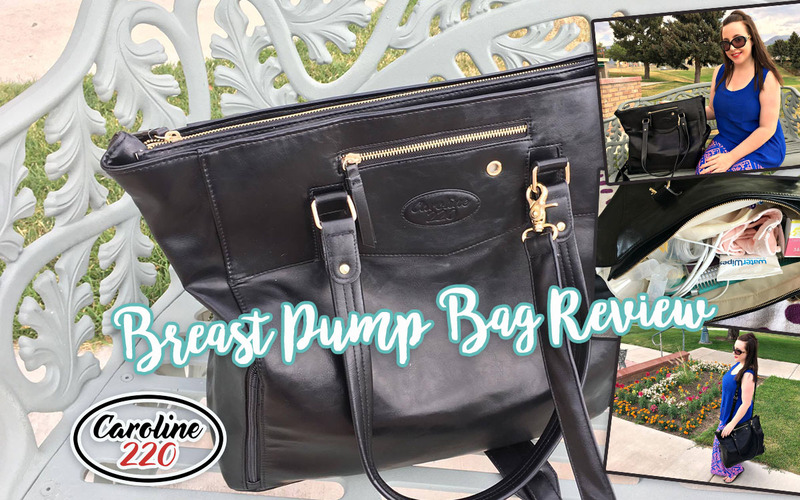 Caroline 220 has created a breast pump bag that offers working/traveling moms an option that is more discreet and a lot more stylish! It’s also quite large so you can fit everything you need conveniently into one bag! The bag has two pockets conveniently located on the bottom corners of the bag that will fit almost any electric breast pump on the market. (I use the Medela Pump In Style Advanced.) The side pockets are insulated which helps with storing pumped milk. (I recommend using one of those sturdy ice packs as well to keep the milk cold until you return home.) Then, you have a large main area that has a couple small pockets built into the side. The bag is lined with a plastic-like material that easily wipes clean if needed, so you don’t have to worry about any spills….although any mama knows that spilled breast milk can be super disappointing! I was really surprised with how BIG this bag is! You can really fit SO much inside it that there is no need to bring a purse and a pumping bag. I prefer larger bags because I always bring a lot of stuff with me, so I am very pleased with the size of this bag! Everything in the main compartment is totally separate from the pumping compartment and the milk storage compartment. And if you need extra room, when you’re not using the side compartments, you can push them back to create more space in the main compartment. This means that your Caroline 220 bag will last even after you are done breastfeeding- you can convert it to a purse or even a gym bag! Speaking of converting- You can use the side straps of the bag or the removable shoulder strap that clips on. Caroline 220 breast pump bags are designed to offer women a stylish option that is also functional. All of the bags are completely free of PVC, BPA, phthalates, lead, and any other material or chemical that could potentially be harmful to you or your baby. Visit www.caroline220.com to get your stylish pumping bag today! They offer fast and FREE SHIPPING to the 48 contiguous states and flat rates to Alaska and Hawaii! They understand that raising a child is very expensive and not everybody can afford to pay $150 for a bag. If somebody contacts us through our website with the price they would like to pay, we will then send them an exclusive coupon to buy the bag at that price as long as the offer is reasonable. This company prides itself on giving back and offers a portion of each sale to a children/family focused non-profit organization of the customer’s choice (entered at checkout). They also donate to the Hydocephalus Association for each new email subscriber they receive. And at the end of the year, they donate 50% of their profits to their customer’s favorite charities! Connect with Caroline 220 on Facebook! Disclaimer: This post was sponsored by Caroline220. I received a complimentary product to facilitate my review. All thoughts are my own. This post may contain affiliate links. Should you choose to make a purchase through my link, I may receive a small commission at no additional cost to you. Thanks for supporting this blog! This bag is awesome! Wish I had one when I nursed our little ones! What a nice bag! Mine is so plain I would love this one.